Bill de Blasio, the current frontrunner to be New York's next mayor, has been making quite a splash with his 'Tale of Two Cities' campaigning slogan. When political slogans are just empty words, they very often fade away. But de Blasio's words, of course, are chock-full of substance: in fact, they encapsulate one of the defining stories of our age, in country after country. This is, of course, a story about the one percent (or the 0.1 percent) versus the rest. A story about inequality and, above all, the role of the financial sector. De Blasio's slogan, of course, reminds me of the title of my last Vanity Fair article, A Tale of Two Londons. At the end of the day, we're talking about the very same phenomenon. That story about a super-expensive building in London was used to illustrate the great divide between an offshore-diving élite and the rest of the country. But there are two salient differences between Britain and the U.S. in this respect. 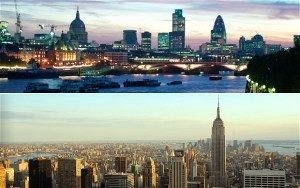 While their two respective financial centres - known respectively as the City of London and Wall Street - are roughly of the same order of magnitude, the U.S.' financial centre is diluted in a much larger democracy, and therefore much more generically susceptible, ultimately, to democratic pressure than is the City. For those Americans whose eyes are watering from the Wall Street Stranglehold on Washington, that may be surprising to hear. But there's no getting away from it. It continues to amaze me that so few politicians, in Britain, the United States, or elsewhere, have stepped beyond the traditional battlegrounds of left and right into this new and exciting terrain, which involves taking the fight properly to Big Finance. This would seem like a no-brainer, amid the large and sustained post-crisis popular pressure. There are a few, of course: Bernie Sanders, Carl Levin or Elizabeth Warren, plus a few politicised civil servants such as Gary Gensler. But nothing like what there could be. The political rewards here are potentially immense: a proper democratic response to financial over-dominance would carry the general public, including many on the right. And they could eeeeasily start to make and propagage new arguments to bolster their case - such as this, this or this. Will de Blasio move properly into this territory, and hold his position there? We'll see, but the signs I can see so far aren't too bad. But then again, this morning's Financial Times story about him contains some pretty scary words. "There were very senior, elected Democrats who have been at financial institutions in the last week. . . They were saying “give him a chance, let him develop relationships, let him hire some people, help him hire people,” the person said. That part in bold sounds very, very ominous. And if it's so hard for politicians in the United States to step up into this political terrain, what hope for offshore-steeped, financially-captured Britain? Read Tamasin Cave's new piece today in Open Democracy, and weep. Update: for background and information on Inequality & Democracy, see here.